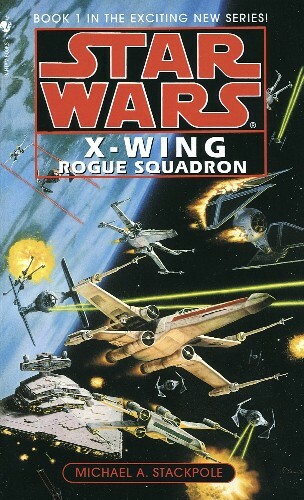 : Welcome back to our final post on X-Wing: Rogue Squadron, a review of the book that was–an after-action report, if you will. I’ll be taking the lead this week, as Z is in a different sort of reporting hell, but I imagine she’ll pop in for her usual trenchant observations. : In personal news, I just cancelled the month of April. The less said about that, the better, so let’s all go back to thinking about the influences on Star Wars, it’s healthier. : Hello, gentlebeings, and welcome to Chapter 40 of Rogue Squadron, wherein the way to not get killed by a commander terminally relieved that you’re not killed is to feed him hometown cake. Makes sense, right? : I think they call that “bribery” in some circles. Or “buttering up” if you’re being nice. : In personal news: Working from home today because my furnace was broken down and the repair visit morphed after three hours to a quote-new-furnace visit, soyeah. : At least it’s April and not October? : True, or they might not have been able to come today. Also, o_o. : Welcome back, readers, and congratulations on reaching the end of March! Good lord but this month was a long year. : On that note Z is having another work week from hell, and since things are a little calmer here, I’m taking the lead on this short chapter. : Z is right now literally taking a 15 minute break between putting in figures to a proposal to do this, in fact. Also: I have a gig and another last minute gig on Saturday, and one of our players in the first gig got the flu, and therefore I still have to rearrange her part in one of our songs to be played by French horn, practice a piano solo that I haven’t practiced in months, and learn a new piece that we the remaining performers from the original set can do with vocal and piano only. In the next, oh, 36 hours. : Hope your work weeks aren’t that bad! : Welcome back, readers. Short chapter this week, which is only fair, as we’re both seeing a lot of Busy in our worlds. But we’re here, and almost through this book! I guess this means we need to figure out what we’re doing next, don’t we? : Hello, gentlebeings, and welcome to Chapter 37 of Rogue Squadron, wherein whose what to the which now? : And why and how? : In personal news, I actually got some emergency music arranging done this week! Yay! …not of anything that’s been on my year-long-at-this-point list, though. Boo. : I have had a quiet week at home, mostly–for one thing my spouse is out of town–but I did take the opportunity to have Georgian food for dinner the other night, and if you’ve never had adjaruli khachapuri with khinkali and a glass of tarragon soda, you’re missing out on quite the experience. : Oh, was that what that neon green thing was. : The proper term (or at least the original term) is tarkhun. And yes, it’s a shade of green that one would not think food or drink is supposed to be. And I remember Ecto-Cooler. : Welcome back to Force Visions, honored readers, as we return to Borleias for a long chapter that will probably get a fair amount of elision. : Oh look who’s using big words. …wait, we both do, and prodigiously and ofttimes. Ne’er you pay any mind. A Read of Ice and Fire Our friend Leigh Butler’s commentary on A Song of Ice and Fire by George R.R. Martin. Mark Reads Our friend Mark Oshiro reads works of fiction for the first time, and comments from his un-spoiled state. The Big Idea John Scalzi features authors describing the “big idea” behind their works on his long-running blog, Whatever. The Eldraeverse Our friend Alistair Young writes nanofic and short stories set in his own science-fictional universe. The Lord of the Rings Reread Our friend Kate Nepveu examines the Lord of the Rings and critical essays on Tolkien’s works. The Wheel of Time Reread Our good friend Leigh Butler does a re-read of the epic Wheel of Time fantasy series.